We provide an extensive range of high purity solvents for all Chromatography techniques. These include traditional solvents for HPLC, Gas Chromatography (GC) and UV Spectrophotometry and for lower analyte detection levels; we offer solvents for LC-MS and UHPLC. We have a wide-range of pack sizes and packaging from our Thermo Fisher and Ajax Finechem brands. 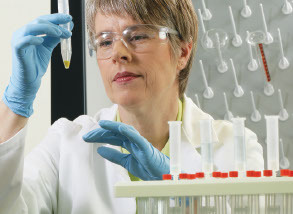 Fisher Scientific Optima grade solvents meet extremely high purity (ppm) levels. They are manufactured for use when contaminant-free performance is essential - HPLC, GC, plasma/ICP, spectrophotometry, environmental testing and other analytical applications. Fisher Chemical Optima LC-MS solvents lead the industry with an unprecedented LC-UV gradient suitability specification. Each lot is screened for UV-absorbing contaminants at every wavelength in the 200-400nm range to afford smooth baselines, reduced interferences, and increased confidence in your analyses. A selection of our high purity Fisher Chemical Optima solvents are available pre-blended with Optima LC-MS modifiers formic acid (FA) and trifluoroacetic acid (TFA) to provide ready-to-use aqueous and organic mobile phase blends for LC-MS applications. Fisher Chemical Optima UHPLC-MS solvents are designed for mobile phases targeting trace analysis by UHPLC-MS. These ultra-pure solvents provide a very low mass noise level in both positive and negative mode ionisation, minimal metal ion content, and very low UHPLC/UV response using photo diode array detection. UNICHROM products are specially made for high performance liquid chromatography. The range includes high purity solvents, tested to meet strict UV absorbance specifications as well as ion pairing reagents. Fisher Scientific GC-Headspace solvents are performance tested to ensure absence of trace level International Conference of Harmonization (ICH) residual solvents for accurate and repeatable determination of trace levels of Class 1, Class 2, and Class 3 residual solvents in pharmaceuticals. To simplify your workflow, Thermo Scientific Dionex has developed all the reagents and standards you need, including anion and cation standards, eluent concentrates, and AutoRegen concentrates. Thermo Scientific Dionex offers high-purity chemicals and standards for transition metal analysis, including ultrapure chelation chromatography reagents for trace and ultratrace transition and lanthanide metal analysis. Need help selecting the right solvent?